A space coffee cup designed by astronaut Donald Pettit - the On-Orbit Coffee Cup - let's you enjoy the world's favorite hot bitter beverage in near Earth orbit. 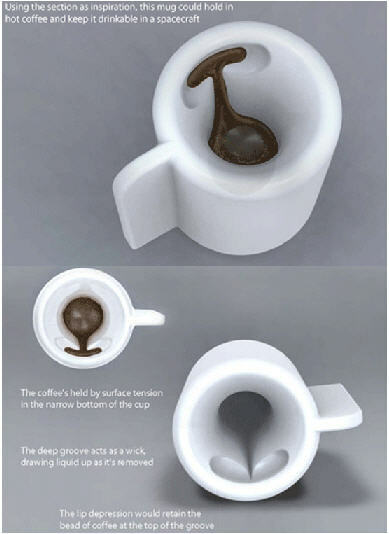 The cup works using surface tension, holding it in the narrow bottom of the cup. The deep groove leading to the place where your lips rest as you sip acts as a wick, drawing liquid up. Larry Niven fans have enjoyed (fantasizing about) his drinking bulb, which can be enjoyed on-planet or off. Where can I get some droobleberry juice? From Tuvie via Boing Boing.